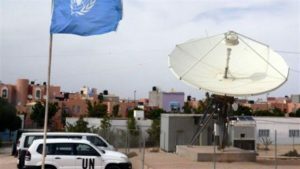 The UN Secretary General Ban Ki-Moon, who is not yet at the end of the tunnel because of the dispute he ignited with Morocco by his blunders and bias, has been rocked by a new scandal within the United Nations mission in the Sahara, the MINURSO. Ban Ki-Moon, strained by the diplomatic crisis he created with Morocco during his early March trip to Algeria, has postponed the presentation of his annual report on the Sahara to the Security Council at least twice. The presentation was initially scheduled for April 8 but was postponed to April 15 before being delayed to April 26, that is to say, two days before the Security Council holds a meeting to examine the Sahara issue and decide on the extension of the MINURSO mandate. But it seems that Ban Ki-Moon will not finish his mandate expiring in December 2016 with flourish. He has ordered the opening of an inquiry into the scandal of fraud committed by MINURSO soldiers in the Sahara. According to a classified document revealed on April 15 by “Inner City Press” (ICP,) an agency accredited to the UN, it is about the diversion of some $50,000 by “60 MINURSO military personnel, out of the 62 that were audited” during the single month of October 2014. The document dated April 8 was sent by the head of logistics of MINURSO, Michael Mulinge Kitivi, to Kim Bolduc, the UN Secretary General’s Special Representative for Western Sahara and Head of MINURSO. Bolduc forwarded a copy of the document to the Assistant Secretary General in charge of UN peacekeeping operations, Herve Ladsous. The MINURSO agents, in complicity with some hoteliers in laâyoune, get false invoices for meals, night stays and other hotel services. The invoices are paid by Morocco’s $3 million yearly voluntary contribution to the operating budget of the MINURSO, entrusted with monitoring the cease-fire established since 1991.